One of our personal top 3 skate shoes, the Emerica Herman G6, was not even reviewed when the article was published. Still, it deserved that spot, not just because of the huge mesh panel on the medial side that allowed far above average breathability. Which other features stood out can be read in the following review. After the sudden death of éS footwear in spring 2012, things in the industry were uncertain, and skaters were left with open-ended questions. Would Soletech and respectively, Emerica and Etnies, plummet down the same path or would they get a boost due to the possibility of newly available resources and attention? One year later, it is safe to say – at least from an outside perspective – both brands are doing fine and Emerica in particular, is coming out with a fair amount of not-so-mediocre designs. Personally, the push towards improved breathability with the Herman G6 and the soon-to-be-released new Andrew Reynolds signature model made the largest impression on me. This is especially so, since major players in the shoe game have shied away from releasing a truly breathable model in recent years, even with the resources available. Needless to say, Emerica surprised many. 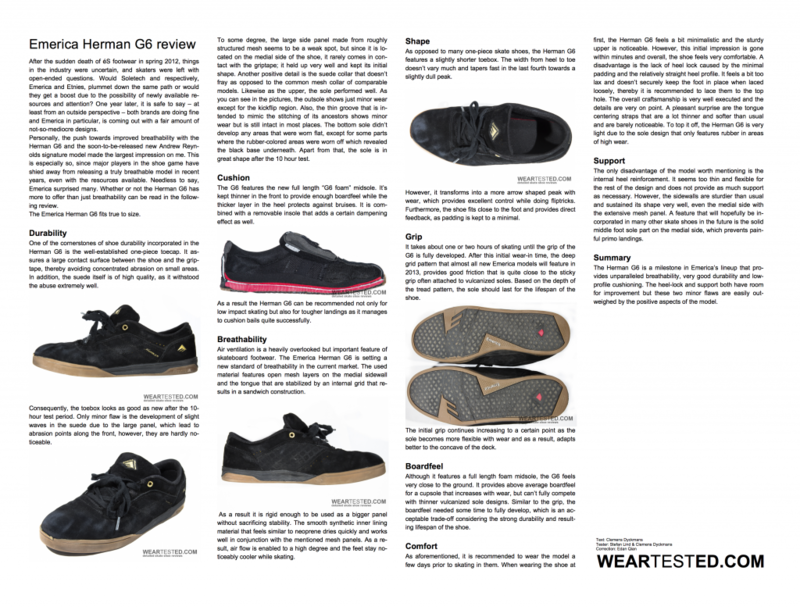 Whether or not the Herman G6 has more to offer than just breathability can be read in the following review. 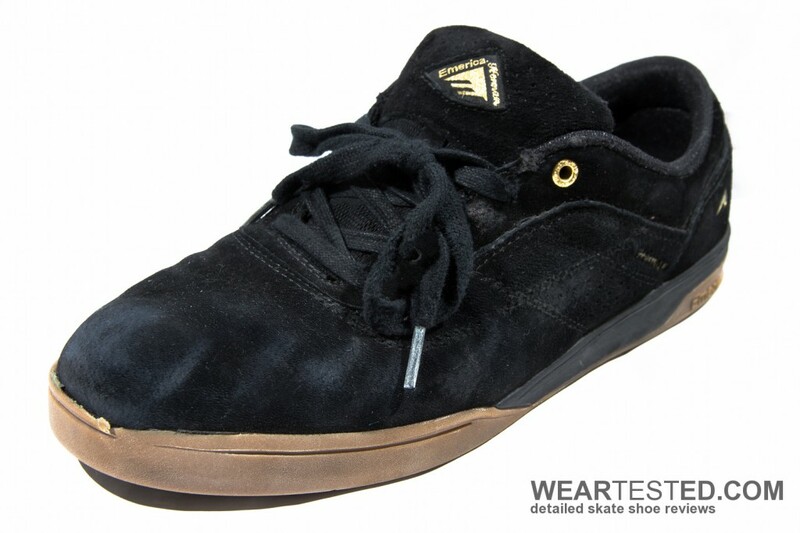 The Emerica Herman G6 fits true to size. One of the cornerstones of shoe durability incorporated in the Herman G6 is the well-established one-piece toecap. It assures a large contact surface between the shoe and the griptape, thereby avoiding concentrated abrasion on small areas. In addition, the suede itself is of high quality, as it withstood the abuse extremely well. Consequently, the toebox looks as good as new after the 10-hour test period. Only minor flaw is the development of slight waves in the suede due to the large panel, which lead to abrasion points along the front, however, they are hardly noticeable. 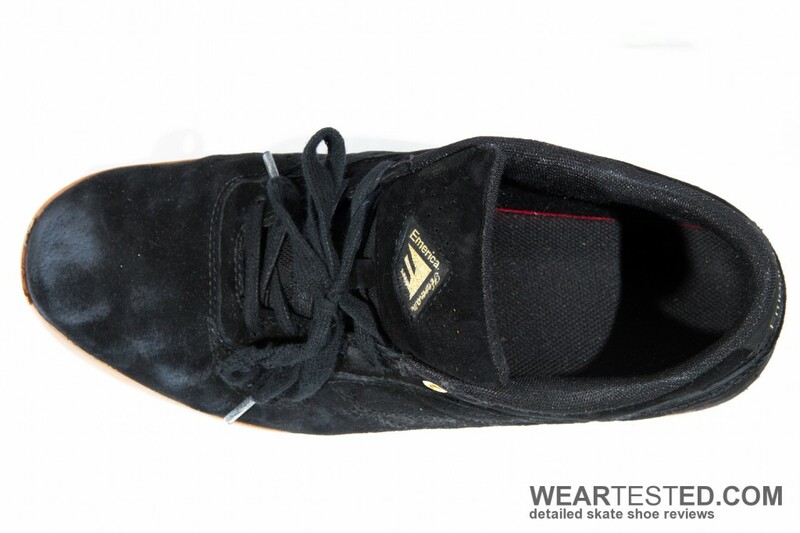 To some degree, the large side panel made from roughly structured mesh seems to be a weak spot, but since it is located on the medial side of the shoe, it rarely comes in contact with the griptape; it held up very well and kept its initial shape. Another positive detail is the suede collar that doesn’t fray as opposed to the common mesh collar of comparable models. Likewise as the upper, the sole performed well. 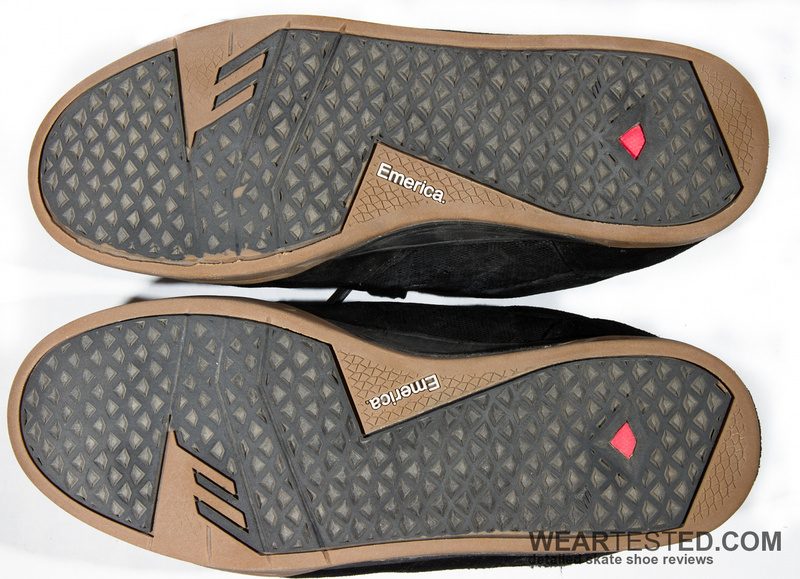 As you can see in the pictures, the outsole shows just minor wear except for the kickflip region. Also, the thin groove that is intended to mimic the stitching of its ancestors shows minor wear but is still intact in most places. The bottom sole didn’t develop any areas that were worn flat, except for some parts where the rubber-colored areas were worn off which revealed the black base underneath. Apart from that, the sole is in great shape after the 10 hour test. The G6 features the new full length “G6 foam” midsole. It’s kept thinner in the front to provide enough boardfeel while the thicker layer in the heel protects against bruises. It is combined with a removable insole that adds a certain dampening effect as well. As a result the Herman G6 can be recommended not only for low impact skating but also for tougher landings as it manages to cushion bails quite successfully. Air ventilation is a heavily overlooked but important feature of skateboard footwear. 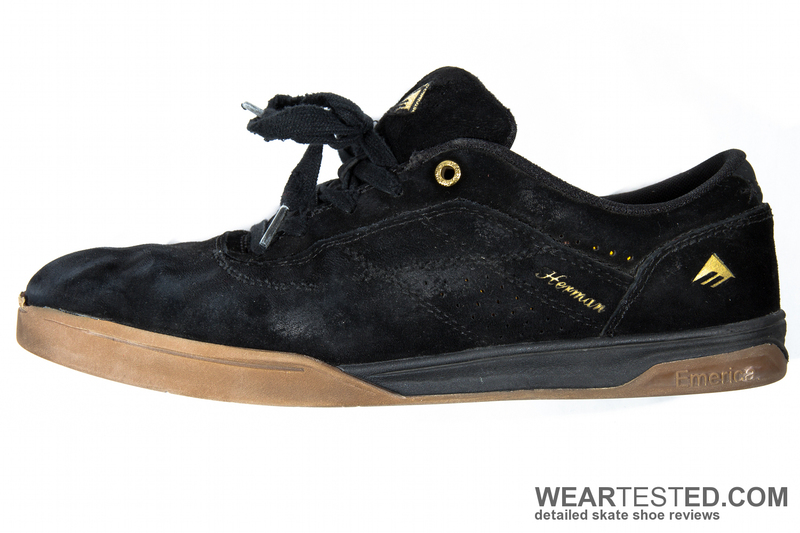 The Emerica Herman G6 is setting a new standard of breathability in the current market. The used material features open mesh layers on the medial sidewall and the tongue that are stabilized by an internal grid that results in a sandwich construction. As a result it is rigid enough to be used as a bigger panel without sacrificing stability. The smooth synthetic inner lining material that feels similar to neoprene dries quickly and works well in conjunction with the mentioned mesh panels. As a result, air flow is enabled to a high degree and the feet stay noticeably cooler while skating. 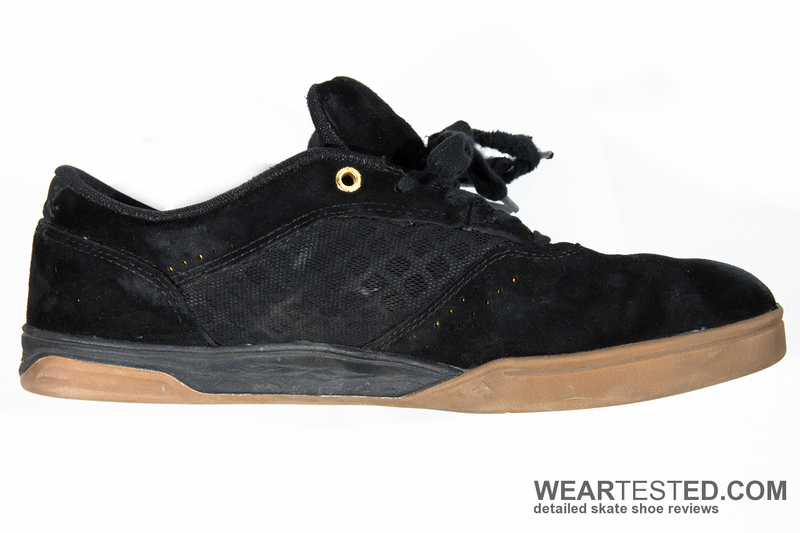 As opposed to many one-piece skate shoes, the Herman G6 features a slightly shorter toebox. The width from heel to toe doesn’t vary much and tapers fast in the last fourth towards a slightly dull peak. However, it transforms into a more arrow shaped peak with wear, which provides excellent control while doing fliptricks. Furthermore, the shoe fits close to the foot and provides direct feedback, as padding is kept to a minimal. It takes about one or two hours of skating until the grip of the G6 is fully developed. 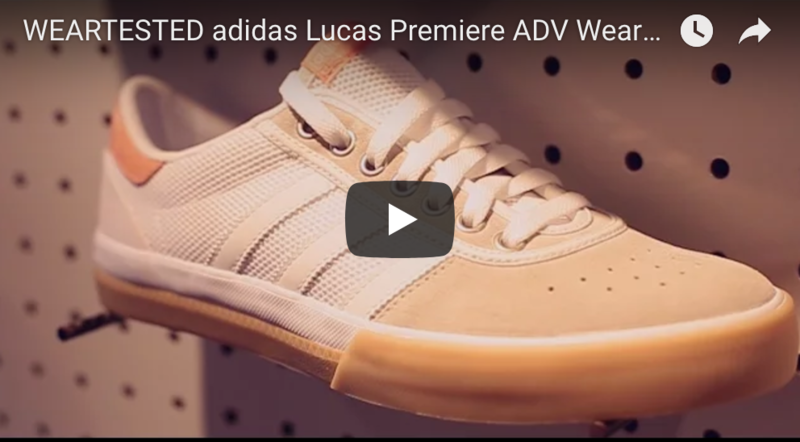 After this initial wear-in time, the deep grid pattern that almost all new Emerica models will feature in 2013, provides good friction that is quite close to the sticky grip often attached to vulcanized soles. Based on the depth of the tread pattern, the sole should last for the lifespan of the shoe. The initial grip continues increasing to a certain point as the sole becomes more flexible with wear and as a result, adapts better to the concave of the deck. Although it features a full length foam midsole, the G6 feels very close to the ground. It provides above average boardfeel for a cupsole that increases with wear, but can’t fully compete with thinner vulcanized sole designs. Similar to the grip, the boardfeel needed some time to fully develop, which is an acceptable trade-off considering the strong durability and resulting lifespan of the shoe. As aforementioned, it is recommended to wear the model a few days prior to skating in them. When wearing the shoe at first, the Herman G6 feels a bit minimalistic and the sturdy upper is noticeable. However, this initial impression is gone within minutes and overall, the shoe feels very comfortable. A disadvantage is the lack of heel lock caused by the minimal padding and the relatively straight heel profile. It feels a bit too lax and doesn’t securely keep the foot in place when laced loosely, thereby it is recommended to lace them to the top hole. The overall craftsmanship is very well executed and the details are very on point. A pleasant surprise are the tongue centering straps that are a lot thinner and softer than usual and are barely noticeable. To top it off, the Herman G6 is very light due to the sole design that only features rubber in areas of high wear. The only disadvantage of the model worth mentioning is the internal heel reinforcement. It seems too thin and flexible for the rest of the design and does not provide as much support as necessary. However, the sidewalls are sturdier than usual and sustained its shape very well, even the medial side with the extensive mesh panel. A feature that will hopefully be incorporated in many other skate shoes in the future is the solid middle foot sole part on the medial side, which prevents painful primo landings. The Herman G6 is a milestone in Emerica’s lineup that provides unparalleled breathability, very good durability and low-profile cushioning. The heel-lock and support both have room for improvement but these two minor flaws are easily outweighed by the positive aspects of the model.